In Woodland Hills, bathroom remodeling is the most popular home remodeling project. H&A My Design shows the newest products and designs available. The bathroom remodeling industry is changing faster than any other. We’ll make sure you get all the bells and whistles for you Woodland Hills luxury bathroom. H&A My Design shows you how to get you exactly you have been dreaming about. We’ll show you how affordable luxury spas are. We’ll guide you through all the details. Whatever design style you choose, H&A My Design will custom craft your luxury bathroom. In Woodland Hills bathroom remodeling is what you want your bathroom to be. H&A My Design makes your remodeling trouble-free. We take responsibility for the entire project. We have the experience in Woodland Hills bathroom remodeling to custom design and build any detail you want. H&A My Design reputation for pleased customers has placed us as the bathroom remodeling contractor you want to call. To begin your Woodland Hills bathroom remodeling conversation, call us. H&A My Design is happy to sit down and talk to you about bathroom remodeling. We design it with you. We H&A My Design wants your bathroom remodeling Woodland Hills to be exceptional. Do you have a lot of great bathroom remodeling ideas? H&A My Design bathroom remodeling designers will take those bathroom remodeling ideas and give you a polished plan. Call H&A My Design. When we talk about a new design for a remodel of your bathroom, changing the floor plan can make sense. Floor plans need to be considered carefully at the beginning of the design. If you don’t you like something right now, it’s not going to get any better after the remodeling is done. The idea of the bathroom just serving as a utility room is over. During a total remodel, the whole space will need carpentry and flooring. Plumbing and electrical work is done during the installation of the new bath and vanity. The luxury bath, shower, spa-tub, and vanity you decide on will be positioned carefully according to the design. During design we’ll get the floor plan perfect. We map your new fixture locations into it. H&A My Design is the contractor to call because we make the most out of the space in your bathroom. 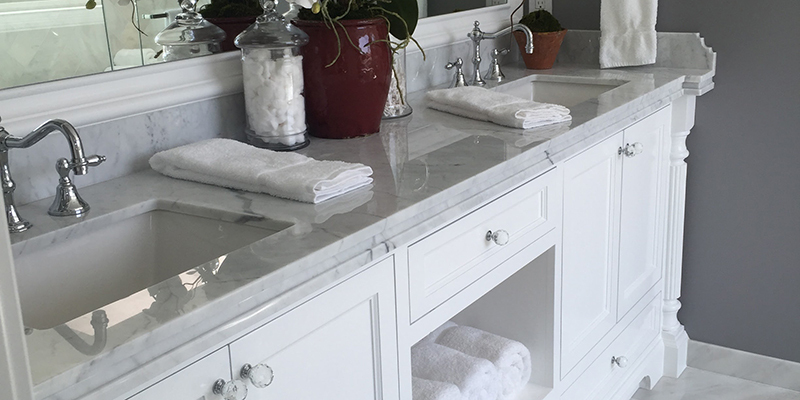 Together we’ll choose the perfect vanity, sink, and hardware to make your bathroom remodel stunning. With our expertise you can customize them according to your ideas. Woodland Hills bathrooms are becoming relaxing luxury spas with designs and colors by H&A My Design. Wind down in a spa-like atmosphere. Bathroom designs by H&A My Design will make that happen. Spa-bath designs for bathroom remodeling Woodland Hills are more tasteful than ever. The finished bathroom reflects your tastes and lifestyle. Watch bathroom remodeling ideas become a work of art using our designers. Call us today, let’s talk about giving your home luxury. For bathroom remodeling in Woodland Hills, call H&A My Design. Talk with one of our designers. You’ll be glad you called.